Villa students are taught basic library and research skills and frequently use the library resources and computers to access the library catalog and the internet to complete assignments. In addition to formal classes, the librarian or teacher reads to the students from a wide variety of literature. All of our students are encouraged to check out books regularly for leisure reading. Students also use the library during study hall, extra-help and afternoon homework club. They frequently relax by browsing through the periodicals or looking at the new books on display. Throughout the year, programs are offered to encourage leisure reading. During “Villa Reads Week” the school hosts a visiting author, and students participate in reading challenges and activities which include “Drop Everything and Read” and “Dress Up As Your Favorite Book Character”. 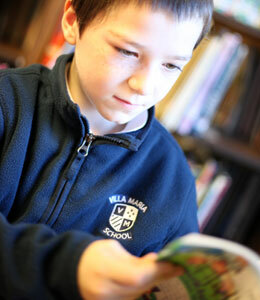 Villa Maria has a Library Plan, which is integrated with the curriculum. There’s something for everyone in the Villa Maria School library. The library has over 8,000 volumes consisting of non-fiction, fiction, biography, reference, periodical and audio/visual materials that support the curriculum and interests of the students. The books are color coded, that is, each book contains a color strip that indicates the reading level. The library has five computers and two printers. These computers can be used for research, to type reports or to check the library catalog. An effective school library should be accessible to the total school community. Therefore, a shelf in the library is dedicated to parent resources, which include volumes about parenting and learning disabilities. The library will soon have a link to the catalog on our website. This will allow parents, as well as teachers and students, to peruse our collection and reserve books from home. For our teachers and staff, there is also a well-stocked professional library with books and periodicals in the faculty room. Our librarian is a Villa Maria favorite! She puts the right book in the right hands of students and teachers, stimulating reading for pleasure and for study. Mrs. Myint guides students in their choice of books, making recommendations according to reading level, interest and curriculum. She assists teachers by correlating and making available materials that coincide with classroom studies and provides parents a variety of resources and current materials on learning disabilities.